The Mid Devon Museum is holding an auction of the All Aboard sculptures (in the shape of loco 1442). 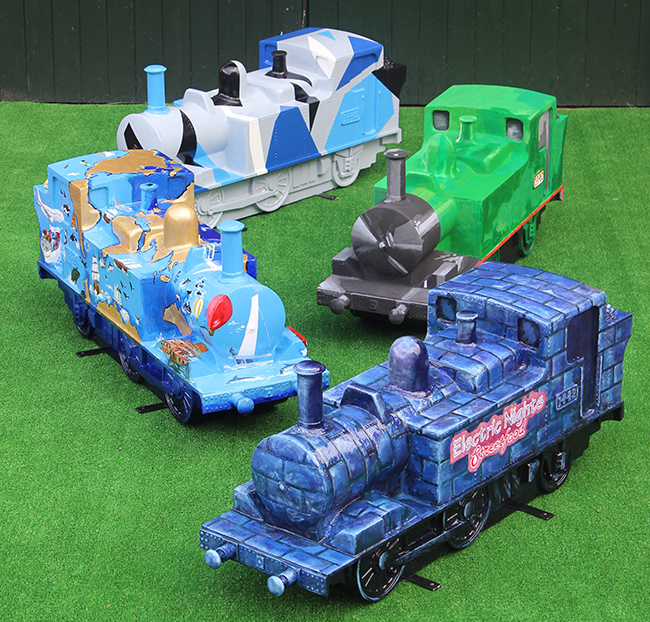 There is just two and a half weeks left of the All Aboard family sculpture trail! If you haven’t completed the trail yet, there is still time to follow the trail map and find all 21 sculptures in the shape of the Tivvy Bumper steam engine. If youâ€™ve already completed the trail, take the chance to revisit your favourite sculptures before 30th October! To mark the start of the last week of the trail, on Saturday 22nd October the museum is offering discounted entry for adults at just £2.00 and accompanied children are free. When the trail is finished, we will be auctioning off the sculptures in a special event at Tiverton Museum on Friday 18th November at 7:30pm. The proceeds from the auction will go to Tiverton Museum and another local charity. The auction is an open event for anyone who is interested in the auction or the raffle (see below) with no prior booking required. The museum is taking commission bids if you are unable to attend the auction but would like to put in a bid. The reserve price for each sculpture is £150. One of the sculptures, the ‘Fiery Fox’ which is on display outside Phoenix House will not be auctioned, but is the prize in a raffle which will be drawn on the same night. The sculpture features characters from Peter’s Railway books who were the sponsor. The books are for children who love railways and engineering. The author, Christopher Vine, has generously donated some signed books which will also be part of the raffle prize. The raffle tickets are now on sale at Tiverton Museum for just £1 !!! We very much hope that you may be interested in attending the auction (and bidding!) If you have any queries regarding the auction please don’t hesitate to get in touch. Poster for downloading and local printing.